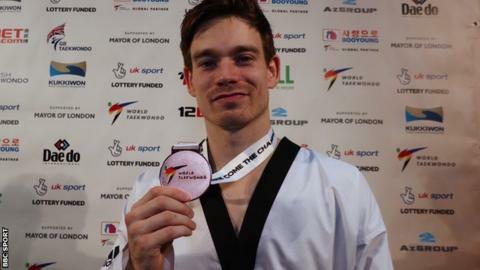 Former Great Britain fighter Aaron Cook won World Taekwondo Grand Prix bronze for Moldova - but revealed he is struggling to fund his career. Cook defeated Portugal's Julio Ferreira 20-10 in the -80kg quarter-finals at London's Copper Box Arena before "running out of steam" against Maksim Khramtcov in the semi-finals. The 26-year-old from Dorset competed for Team GB at the 2008 Olympics before switching to the Isle of Man after being controversially overlooked for London 2012. His nationality was purchased by Moldovan billionaire Igor Iuzefovici in 2015, but support stopped after Cook lost in the opening round at Rio 2016. "I'm back funding myself, my family supporting me, and it's extremely difficult," he told BBC Sport. Moldova had backed Cook in the hope that he would secure them a first-ever Olympic gold medal, but the three-time European champion was eliminated in his first match at the Rio 2016 Games. He has since risen back to number two in the world, claimed bronze at the World Championships in June and silver at September's Morocco Grand Prix. However, Cook admitted he is relying on help from family as well as his girlfriend, world champion Bianca Walkden, and friends to sustain his career. "I didn't want to retire after Rio, having given that kind of performance on that stage after all the hard work I've put in, so I said I'll give it another shot," he said. "These events are all around the world though and my parents have had to fund everything. "I've got no training partners, but have been so lucky to have Bianca who's tried her absolute hardest to help me train and (ex GB fighter) Jordan Gayle, as well as others who've got me back on this world stage again." Cook says that a return to the British set-up, which he left in 2011, and competing for Great Britain is now "impossible." "I'm happy to keep competing for Moldova but if I were to switch back that would mean three years before I could compete again, and then I'd miss Tokyo 2020," added Cook, who conceded it is unlikely GB would push for his return. "You have to look at how well GB are doing and the structure there is working for them - I just have to keep putting medals on the table like this and hopefully one day someone will help out again." The British team finished with a record haul of five medals from the London Grand Prix, with Walkden (+80kg), Jade Jones (-57kg) and Lauren Williams (-67kg) securing gold. GB men Bradly Sinden (-68kg silver) and Mahama Cho (+80kg bronze) were the team's other medallists. The next major event for Cook and Britain's leading fighters will be the World Taekwondo Grand Prix final in Ivory Coast in December.